We have restored CAMB 2.16 apps successfully for all platforms so all project specific errors (Signature and/or Checksum) should no longer be present. Also, most WUs for camb 2.16 are more resource heavy than the previous WU's for 2.15 so we have increased the credit for each WU from 140 to 200. If there are any disputes about this we will be happy to address them. If you feel that the credit being given for the 2.16 app, WUs is too little/ too much please start a thread related to this on the Wish List message board. Thank you. I shouldn't really post this here because this piece of news has nothing to do with CAMB 2.16 WUs but I felt this thread was in need of some good, solid, uplifting news. Everyone that has WUs lying around in their task list which errored out while downloading weeks ago will get 120 credits per every such WU. I know I have around 20 or so myself. I am looking at a few solutions to dynamically allocate credit for WUs instead of having credit set at a flat rate. As Paul mentioned earlier, there are some WUs that are not as work intensive as others while some that take (from Pluk) longer than average time. This thread seems to indicate very strongly that our users avg out credit at 400 per WU. 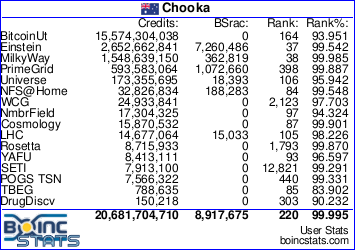 I will take the avg claimed credit from all my trusted machines (there are around 10) = N credits. Finally I will avg the two, so thats = (N + 400)/2 and set that to be the credit granted for CAMB 2.16 WUs till I have figured out a good way to dynamically allocate credit. I hope this keeps everyone happy for now. Finally, I would like to mention that both Scott and my finals are going to start in 2 weeks so we will not be as active on the project. I will also be gone for 2 weeks between May 17th and June 1st. I will try to stay on the forums at that time but will not be doing any project development till I get back. A total of 5000 credits have been added to profiles of all active Csomo@home users. This is meant for expired/failed WUs due to project down-time and to compensate for the earlier low credit per WU payment for resource intensive CAMB 2.16 WUs. Also, the time bound for these new WUs has been incresaed from 10 days to 15 days which should be enough to complete crunching them even on machines ~5 years old. For some reason I got the 5k bonus despite not having crunched any Cosmo for 12 months ??? I am actively crunching Cosmo and currently sit on 999,984 credits. Nah, I think I'll hang onto it ;D. Seeing as I crunch mostly low paying projects I'll consider it my reward for persevering with those projects :coolgleam:. Having said that I have no objections if the admins decide to rescind their gift. A total of 5000 credits have been added to profiles of all active Csomo@home users. So now we've got KRudd aboard? For a long time volunteers over at Cosmology@Home have been discouraged by the lack of communications by the project administrators. A couple of days ago the project scientist Benjamin Wandelt replied to a post by Cruncher Pete. I agree that we have been lacking in our communication activities. The good news is that we are taking active steps to improve the project at the moment. We have been using the small amount of funding we have on keeping C@H up. We had some downtime yesterday due to a hardware failure. This has now been resolved. - some infrastructure changes that will allow us to push new code versions much more efficiently. These changes will set us up for launching new cosmology applications (beyond the current CAMB). Let me thank you for your patience and for your continued involvement in C@H.
It's good to see the project is still alive. In case anyone here is interested, Cosmology@Home are looking for OSX/Virtualbox beta testers. Hi all, project developer at Cosmology@Home here. We're launching a major update soon which we've been beta testing over at beta.cosmologyathome.org. One of the things this update adds is support for OSX, and we could use more beta testers for this. If you'd be willing to participate, checkout this thread or just point your client to the url above. You will need a 64bit processor and Virtualbox installed. Any credits you gain on the beta server will transfer over once we upgrade the real thing. Thanks for your help! Finally, they have work again for both legacy and docker. I didn't know they were out of work! This shockingly, slow credit provider is on my hit list one day. My rank stinks and I regret adding it to my projects...lol. Only because of the grindingly, slow credits. One day. Got too many other priorities yet.